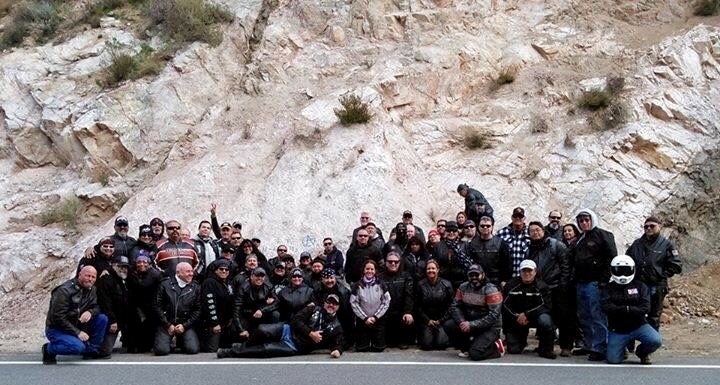 Last weekend, I went on another group ride that was hosted by the Know Where Riders based out of Rancho Cucamonga, CA. A friend introduced me to this group and they post all of their ride on a website called http://www.meetup.com. Meetup is an online social networking portal that facilitates offline group meetings in various localities around the world. Meetup allows members to find and join groups unified by a common interest, such as politics, books, games, movies, health, pets, careers or hobbies. It was the first time I have heard of the website and after a quick review, I discovered that there 35 motorcycle meet up groups within 50 miles radius of where I live. The hosted ride was called “SOA – JAX’s final ride”. The ride took us to the Jax Teller’s memorial wall that was featured in the last episode of the final season of Sons of Anarchy (SOA). No, I’m not a fan of SOA and actually haven’t watched the show. At first I was a bit hesitant to join this ride since there were going to be over seventy-five motorcycles and I’m not a fan of large group ride. However, I figured I should go for it since it was in my neck of the wood. 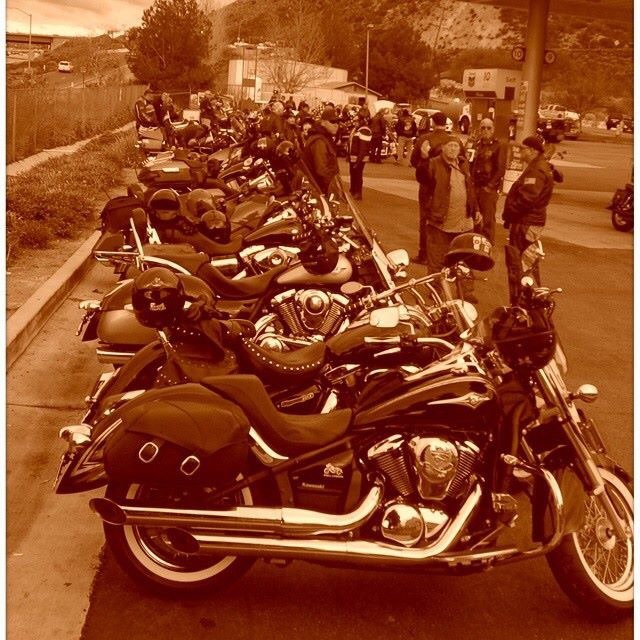 This group ride route took us through some of the local highways where sons of anarchy was filmed and also the beginning of the chase were Jackson Teller leads the police on his final ride to meet the reaper. Once we got to the location where there is rock art (graffiti) memorializing the location where Jax Teller and his father were killed (in separate incidents). It was interesting to see grown men and women get so excited over an imaginary events then I realize why the hell not. We all need something to believe in something whether it’s in the sport teams, TV shows or in their religious belief. So who am I to judge when I believe in the afterlife so I can hold onto his memory. So I decided to join in on the photo opportunities so I can say to my kids and grandkids that I have been there. After visiting the some of the locations, we continued on to Canyon Country to have lunch at the Route 66 Classic Grill in Canyon Country. This place is worth a stop for a meal, the food was good and service was excellent since they had to deal with seventy-five of us. Overall, I was pretty impressed with the group organizers, no one got separated during the ride. Since I rode in the back of the group, I wished that I had the GroPro with me during this ride. It was an impressive sight to see seventy-five bikes in perfect staggered formation for miles ahead of me on a winding road. Very interesting! Where’s my picture of you? Glad to know that I’m not the only biker who never watched Sons of Anarchy! I don’t care for big group rides either, glad to hear that your ride was well-organized…it’s been my experience that large rides usually turn into a bit of a farce. Aww…me too am glad to know that I’m not alone out there about SOA. I think that will be the strangest thing about my trip that I won’t be watching show and people will be talking about them. You aren’t alone, I couldn’t watch it either. A group ride usually turns in to a group race, I tend to avoid that stuff too. I usually do too but I was impressed.